Beer bottle Coolies leave your client with a more refreshing adult beverage and your brand on their mind. The beer bottle koozie is perfect for promoting a business, charitable marketing, or even that summer party. This custom coolie can be designed with your creativity or with the help of our specialists in the art department, guaranteeing you something unique for your particular event. Designed for 12 oz. 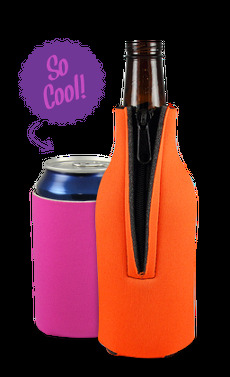 long-neck bottles and made with 1/8" thick neoprene wet suit material, allowing you to carry your beverage in and out of the water without any damage done to your beer bottle koozie. Your beer bottle coolies are also equipped with a built-in zipper to insure maximum insulation. Buy your beer bottle coolies today.